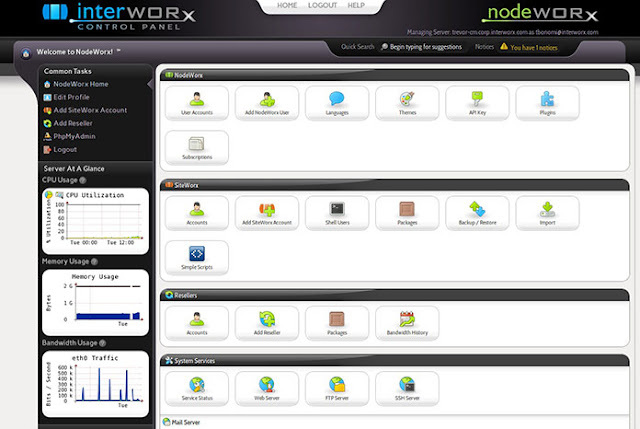 InterWorx comes in two package versions: NodeWorx (to manage a server) and SiteWorx (to manage a site). Interworx has a nice plugin system, which allows for quick installs of applications, much like the Softaculous web package manager. InterWorx also has a command line interface. InterWorx is perhaps the most scalable and reliable solution available for managing a website, server, or hosting business. Here, we'll look at some features that make it unique. NodeWorx is the system administrator interface for managing server-wide behavior and hosting (SiteWorx) accounts. From there, you can navigate using the menu or use the Quick Search feature to get where you need to go. SiteWorx is the website owner interface that you and your customers can use to manage your domains, email, and other hosting features.